Should we pay children to read books or to get good grades? Should we allow corporations to pay for the right to pollute the atmosphere? Is it ethical to pay people to test risky new drugs or to donate their organs? What about hiring mercenaries to fight our wars? Auctioning admission to elite universities? Selling citizenship to immigrants willing to pay?In What Money Can't Buy, Michael J. Sandel takes on one of the biggest ethical questions of our time: Is there something wrong with a world in which everything is for sale? If so, how can we prevent market values from reaching into spheres of life where they don't belong? What are the moral limits of markets?In recent decades, market values have crowded out nonmarket norms in almost every aspect of lifemedicine, education, government, law, art, sports, even family life and personal relations. 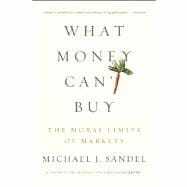 Without quite realizing it, Sandel argues, we have drifted from havinga market economy to beinga market society. Is this where we want to be?In his New York Timesbestseller Justice, Sandel showed himself to be a master at illuminating, with clarity and verve, the hard moral questions we confront in our everyday lives. Now, in What Money Can't Buy, he provokes an essential discussion that we, in our market-driven age, need to have: What is the proper role of markets in a democratic societyand how can we protect the moral and civic goods that markets don't honor and that money can't buy? Michael J. Sandel is the Anne T. and Robert M. Bass Professor of Government at Harvard University. His work has been the subject of television series on PBS and the BBC. His most recent book is the New York Times bestseller Justice: What’s the Right Thing to Do?. Nobody likes to wait in line. Sometimes you can pay to jump the queue. It’s long been known that, in fancy restaurants, a handsome tip to the maître d’ can shorten the wait on a busy night. Such tips are quasi bribes and handled discreetly. No sign in the window announces immediate seating for anyone willing to slip the host a fifty-dollar bill. But in recent years, selling the right to cut in line has come out of the shadows and become a familiar practice. Some people object to the idea of selling the right to jump the queue. They argue that the proliferation of fast-track schemes adds to the advantages of affluence and consigns the poor to the back of the line. Opponents of paid express lanes call them “Lexus lanes” and say they are unfair to commuters of modest means. Others disagree. They argue that there is nothing wrong with charging more for faster service. Federal Express charges a premium for overnight delivery. The local dry cleaner charges extra for same-day service. And yet no one complains that it’s unfair for FedEx, or the dry cleaner, to deliver your parcel or launder your shirts ahead of someone else’s. To an economist, long lines for goods and services are wasteful and inefficient, a sign that the price system has failed to align supply and demand. Letting people pay for faster service at airports, at amusement parks, and on highways improves economic efficiency by letting people put a price on their time. Even where you’re not allowed to buy your way to the head of the line, you can sometimes hire someone else to queue up on your behalf. Each summer, New York City’s Public Theater puts on free outdoor Shakespeare performances in Central Park. Tickets for the evening performances are made available at 1:00 p.m., and the line forms hours in advance. In 2010, when Al Pacino starred as Shylock in The Merchant of Venice, demand for tickets was especially intense. Central Park is not the only place where there’s money to be made by those who stand and wait. In Washington, D.C., the line-standing business is fast becoming a fixture of government. When congressional committees hold hearings on proposed legislation, they reserve some seats for the press and make others available to the general public on a first-come, first-served basis. Depending on the subject and the size of the room, the lines for the hearings can form a day or more in advance, sometimes in the rain or in the chill of winter. Corporate lobbyists are keen to attend these hearings, in order to chat up lawmakers during breaks and keep track of legislation affecting their industries. But the lobbyists are loath to spend hours in line to assure themselves a seat. Their solution: pay thousands of dollars to professional line-standing companies that hire people to queue up for them. But opportunity for Gomes meant frustration for some environmentalists. When a group of them showed up for the climate change hearing, they couldn’t get in. The lobbyists’ paid stand-ins had already staked out all the available seats in the hearing room.16 Of course, it might be argued that if the environmentalists cared enough about attending the hearing, they too could have queued up overnight. Or they could have hired homeless people to do it for them. There is something distasteful about scalping tickets to see a doctor. For one thing, the system rewards unsavory middlemen rather than those who provide the care. Dr. Tang could well ask why, if a rheumatology appointment is worth $100, most of the money should go to scalpers rather than to him, or his hospital. Economists might agree and advise hospitals to raise their prices. In fact, some Beijing hospitals have added special ticket windows, where the appointments are more expensive and the lines much shorter.19 This high-priced ticket window is the hospital’s version of the no-wait premium pass at amusement parks or the fast-track lane at the airport—a chance to pay to jump the queue. But regardless of who cashes in on the excess demand, the scalpers or the hospital, the fast track to the rheumatologist raises a more basic question: Should patients be able to jump the queue for medical care simply because they can afford to pay extra? The scalpers and special ticket windows at Beijing hospitals raise this question vividly. But the same question can be asked of a subtler form of queue jumping increasingly practiced in the U.S.—the rise of “concierge” doctors. The drawback, of course, is that concierge care for a few depends on shunting everyone else onto the crowded rolls of other doctors.29 It therefore invites the same objection leveled against all fast-track schemes: that it’s unfair to those left languishing in the slow lane. Concierge medicine differs, to be sure, from the special ticket windows and the appointment-scalping system in Beijing. Those who can’t afford a concierge doc can generally find decent care elsewhere, while those who can’t afford a scalper in Beijing are consigned to days and nights of waiting. But the two systems have this in common: each enables the affluent to jump the queue for medical care. The queue jumping is more brazen in Beijing than in Boca Raton. There seems a world of difference between the clamor of the crowded registration hall and the calm of the waiting room with the uneaten sponge cake. But that’s only because, by the time the concierge patient arrives for his or her appointment, the culling of the queue has already taken place, out of view, by the imposition of the fee. And this shift reflects something bigger—the growing reach of money and markets into spheres of life once governed by nonmarket norms. Selling the right to cut in line is not the most grievous instance of this trend. But thinking through the rights and wrongs of line standing, ticket scalping, and other forms of queue jumping can help us glimpse the moral force—and moral limits—of market reasoning. Is there anything wrong with hiring people to stand in line, or with scalping tickets? Most economists say no. They have little sympathy for the ethic of the queue. If I want to hire a homeless person to queue up on my behalf, they ask, why should anyone complain? If I’d rather sell my ticket than use it, why should I be prevented from doing so? The case for markets over queues draws on two arguments. One is about respecting individual freedom; the other is about maximizing welfare, or social utility. The first is a libertarian argument. It maintains that people should be free to buy and sell whatever they please, as long as they don’t violate anyone’s rights. Libertarians oppose laws against ticket scalping for the same reason they oppose laws against prostitution, or the sale of human organs: they believe such laws violate individual liberty, by interfering with the choices made by consenting adults. The second argument for markets, more familiar among economists, is utilitarian. It says that market exchanges benefit buyers and sellers alike, thereby improving our collective well-being, or social utility. The fact that my line stander and I strike a deal proves that we are both better off as a result. Paying $125 to see the Shakespeare play without having to wait in line must make me better off; otherwise I wouldn’t have hired the line stander. And earning $125 by spending hours in a queue must make the line stander better off; otherwise he or she wouldn’t have taken the job. We are both better off as a result of our exchange; our utility increases. This is what economists mean when they say that free markets allocate goods efficiently. By allowing people to make mutually advantageous trades, markets allocate goods to those who value them most highly, as measured by their willingness to pay. If the free-market argument is correct, ticket scalpers and line-standing companies should not be vilified for violating the integrity of the queue; they should be praised for improving social utility by making underpriced goods available to those most willing to pay for them. The first part of the argument is flawed. Hired line standers do not reduce the total number of people who see the performance; they only change who sees it. It’s true, as the spokesperson claims, that the line standers take tickets that would otherwise go to people farther back in the queue who are eager to see the play. But those who wind up with those tickets are also eager to see the play. That’s why they shell out $125 to hire a line stander. What the spokesperson probably meant is that ticket scalping is unfair to those who can’t afford the $125. It puts ordinary folks at a disadvantage and makes it harder for them to get tickets. This is a stronger argument. When a line stander or scalper gets a ticket, someone behind him or her in the queue loses out, someone who may be unable to afford the scalper’s price. Free-market advocates might reply as follows: If the theater really wants to fill its seats with people eager to see the play and to maximize the pleasure its performances give, then it should want tickets to go to those who value them most highly. And those are the people who will pay most for a ticket. So the best way to pack the house with an audience that will derive the greatest pleasure from the play is to let the free market operate—either by selling tickets for whatever price the market will bear, or by allowing line standers and scalpers to sell to the highest bidders. Getting tickets to those willing to pay the highest price for them is the best way of determining who most values a Shakespeare performance. But this argument is unconvincing. Even if your goal is to maximize social utility, free markets may not do so more reliably than queues. The reason is that the willingness to pay for a good does not show who values it most highly. This is because market prices reflect the ability as well as the willingness to pay. Those who most want to see Shakespeare, or the Red Sox, may be unable to afford a ticket. And in some cases, those who pay the most for tickets may not value the experience very highly at all. I’ve noticed, for example, that the people sitting in the expensive seats at the ballpark often show up late and leave early. This makes me wonder how much they care about baseball. Their ability to afford seats behind home plate may have more to do with the depth of their pockets than their passion for the game. They certainly don’t care as much as some fans, especially young ones, who can’t afford box seats but who can tell you the batting average of every player in the starting lineup. Since market prices reflect the ability as well as the willingness to pay, they are imperfect indicators of who most values a particular good. This is a familiar point, even an obvious one. But it casts doubt on the economist’s claim that markets are always better than queues at getting goods to those who value them most highly. In some cases, the willingness to stand in line—for theater tickets or for the ball game—may be a better indicator of who really wants to attend than the willingness to pay. Defenders of ticket scalping complain that queuing “discriminates in favor of people who have the most free time.”33 That’s true, but only in the same sense that markets “discriminate” in favor of people who have the most money. As markets allocate goods based on the ability and willingness to pay, queues allocate goods based on the ability and willingness to wait. And there is no reason to assume that the willingness to pay for a good is a better measure of its value to a person than the willingness to wait. So the utilitarian case for markets over queues is highly contingent. Sometimes markets do get goods to those who value them most highly; other times, queues may do so. Whether, in any given case, markets or queues do this job better is an empirical question, not a matter that can be resolved in advance by abstract economic reasoning. But the utilitarian argument for markets over queues is open to a further, more fundamental objection: utilitarian considerations are not the only ones that matter. Certain goods have value in ways that go beyond the utility they give individual buyers and sellers. How a good is allocated may be part of what makes it the kind of good it is. Think again about the Public Theater’s free summer Shakespeare performances. “We want people to have that experience for free,” said the spokesperson, explaining the theater’s opposition to hired line standers. But why? How would the experience be diminished if tickets were bought and sold? It would be diminished, of course, for those who’d like to see the play but can’t afford a ticket. But fairness is not the only thing at stake. Something is lost when free public theater is turned into a market commodity, something beyond the disappointment experienced by those who are priced out of attending. The Public Theater sees its free outdoor performances as a public festival, a kind of civic celebration. It is, so to speak, a gift the city gives itself. Of course, seating is not unlimited; the entire city cannot attend on any given evening. But the idea is to make Shakespeare freely available to everyone, without regard to the ability to pay. Charging for admission, or allowing scalpers to profit from what is meant to be a gift, is at odds with this end. It changes a public festival into a business, a tool for private gain. It would be as if the city made people pay to watch the fireworks on the Fourth of July. Similar considerations explain what’s wrong with paid line standing on Capitol Hill. One objection is about fairness: it’s unfair that wealthy lobbyists can corner the market on congressional hearings, depriving ordinary citizens of the opportunity to attend. But unequal access is not the only troubling aspect of this practice. Suppose lobbyists were taxed when they hired line-standing companies, and the proceeds were used to make line-standing services affordable for ordinary citizens. The subsidies might take the form, say, of vouchers redeemable for discounted rates at line-standing companies. Such a scheme might ease the unfairness of the present system. But a further objection would remain: turning access to Congress into a product for sale demeans and degrades it. From an economic point of view, allowing free access to congressional hearings “underprices” the good, giving rise to queues. The line-standing industry remedies this inefficiency by establishing a market price. It allocates seats in the hearing room to those who are willing to pay the most for them. But this values the good of representative government in the wrong way. We can see this more clearly if we ask why Congress “underprices” admission to its deliberations in the first place. Suppose, striving mightily to reduce the national debt, Congress decided to charge admission to its hearings—$1,000, say, for a front-row seat at the Appropriations Committee. Many people would object, not only on the grounds that the admission fee is unfair to those unable to afford it but also on the grounds that charging the public to attend a congressional hearing is a kind of corruption. We often associate corruption with ill-gotten gains. But corruption refers to more than bribes and illicit payments. To corrupt a good or a social practice is to degrade it, to treat it according to a lower mode of valuation than is appropriate to it. Charging admission to congressional hearings is a form of corruption in this sense. It treats Congress as if it were a business rather than an institution of representative government. Cynics might reply that Congress is already a business, in that it routinely sells influence and favors to special interests. So why not acknowledge this openly and charge admission? The answer is that the lobbying, influence peddling, and self-dealing that already afflict Congress are also instances of corruption. They represent the degradation of government in the public interest. Implicit in any charge of corruption is a conception of the purposes and ends an institution (in this case, Congress) properly pursues. The line-standing industry on Capitol Hill, an extension of the lobbying industry, is corrupt in this sense. It is not illegal, and the payments are made openly. But it degrades Congress by treating it as a source of private gain rather than an instrument of the public good. WHAT’S WRONG WITH TICKET SCALPING? Why do some instances of paid queue jumping, line standing, and ticket scalping strike us as objectionable, while others do not? The reason is that market values are corrosive of certain goods but appropriate to others. Before we can decide whether a good should be allocated by markets, queues, or in some other way, we have to decide what kind of good it is and how it should be valued. Figuring this out is not always easy. Consider three examples of “underpriced” goods that have recently given rise to ticket scalping: campsites at Yosemite National Park, open-air masses conducted by Pope Benedict XVI, and live concerts by Bruce Springsteen. Yosemite National Park, in California, attracts more than four million visitors a year. About nine hundred of its prime campsites can be reserved in advance, at a nominal cost of $20 per night. The reservations can be booked, by telephone or online, beginning at 7:00 a.m. on the fifteenth of each month, up to five months in advance. But it’s not easy to get one. Demand is so intense, especially for the summer, that the campsites are fully booked within minutes of becoming available. In 2011, however, The Sacramento Bee reported that ticket scalpers were offering Yosemite campsites for sale on Craigslist for $100 to $150 per night. The National Park Service, which prohibits the resale of reservations, was flooded with complaints about the scalpers and tried to prevent the illicit trade.34 According to standard market logic, it’s not clear why it should: If the National Park Service wants to maximize the welfare society derives from Yosemite, it should want the campsites to be used by those who most value the experience, as measured by their willingness to pay. So rather than try to defeat the scalpers, it should welcome them. Or it should raise the price it charges for campsite reservations to the market-clearing price and eliminate the excess demand. Underlying the hostility to scalping campsites at Yosemite are actually two objections—one about fairness, the other about the proper way of valuing a national park. The first objection worries that scalping is unfair to people of modest means, who can’t afford to pay $150 a night for a campsite. The second objection, implied by the editorial’s rhetorical question (“Is nothing sacred?”) draws on the idea that some things should not be up for sale. According to this idea, national parks are not merely objects of use or sources of social utility. They are places of natural wonder and beauty, worthy of appreciation, even awe. For scalpers to auction access to such places seems a kind of sacrilege. Those who bought tickets from scalpers might disagree. They succeeded in paying to celebrate a sacrament. But the church spokeswoman was trying, I think, to make a different point: although it may be possible to gain admission to a papal mass by buying a ticket from a scalper, the spirit of the sacrament is tainted if the experience is up for sale. Treating religious rituals, or natural wonders, as marketable commodities is a failure of respect. Turning sacred goods into instruments of profit values them in the wrong way. So why not charge the market price? For Springsteen, keeping ticket prices relatively affordable is a way of keeping faith with his working-class fans. It is also a way of expressing a certain understanding of what his concerts are about. They are moneymaking ventures, to be sure, but only in part. They are also celebratory events whose success depends on the character and composition of the crowd. The performance consists not only in the songs but also in the relationship between the performer and his audience, and the spirit in which they gather. Some may see this as mere public relations, a strategy to forgo some revenue today to preserve goodwill and maximize earnings in the long term. But this is not the only way to make sense of it. Springsteen may believe, and be right to believe, that to treat his live performance as a purely market good would be to demean it, to value it in the wrong way. In this respect at least, he may have something in common with Pope Benedict. We’ve considered several ways of paying to cut in line: hiring line standers, buying tickets from scalpers, or purchasing line-cutting privileges directly from, say, an airline or an amusement park. Each of these transactions supplants the ethic of the queue (waiting your turn) with the ethic of the market (paying a price for faster service). The principle seems apt on playgrounds, at bus stops, and when there’s a line for the public restroom at a theater or ballpark. We resent people cutting in front of us. If someone with an urgent need asks to jump the queue, most people will oblige. But we’d consider it odd if someone at the back of the line offered us $10 to trade places—or if the management set up express pay toilets alongside the free ones, to accommodate affluent customers (or desperate ones). But the ethic of the queue does not govern all occasions. If I put my house up for sale, I’m under no obligation to accept the first offer that comes along, simply because it’s the first. Selling my house and waiting for a bus are different activities, properly governed by different norms. There’s no reason to assume that any single principle—queuing or paying—should determine the allocation of all goods. Sometimes norms change, and it is unclear which principle should prevail. Think of the recorded message you hear, played over and over, as you wait on hold when calling your bank, HMO, or cable television provider: “Your call will be answered in the order in which it was received.” This is the essence of the ethic of the queue. It’s as if the company is trying to soothe our impatience with the balm of fairness. Is there anything wrong with answering the calls of your best (or most promising) customers first? It depends on the kind of good you’re selling. Are they calling about an overdraft fee or an appendectomy? Of course, markets and queues are not the only ways of allocating things. Some goods we distribute by merit, others by need, still others by lottery or chance. Universities typically admit students with the greatest talent and promise, not those who apply first or offer the most money for a place in the freshman class. Hospital emergency rooms treat patients according to the urgency of their condition, not according to the order of their arrival or their willingness to pay extra to be seen first. Jury duty is allocated by lottery; if you are called to serve, you can’t hire someone else to take your place. The tendency of markets to displace queues, and other nonmarket ways of allocating goods, so pervades modern life that we scarcely notice it anymore. It is striking that most of the paid queue-jumping schemes we’ve considered—at airports and amusement parks, at Shakespeare festivals and congressional hearings, in call centers and doctors’ offices, on freeways and in national parks—are recent developments, scarcely imaginable three decades ago. The demise of the queue in these domains may seem a quaint concern. But these are not the only places that markets have invaded. Even where you’re not allowed to buy your way to the head of the line, you can sometimes hire someone else to queue up on your behalf. Each summer, New York City’s Public Theater puts on free outdoor Shakespeare performances in Central Park. Tickets for the evening performances are made available at 1:00 p.m., and the line forms hours in advance. In 2010, when Al Pacino starred as Shylock inThe Merchant of Venice, demand for tickets was especially intense. The first part of the argument is flawed. Hired line standers do not reduce the total number of people who see the performance; they only changewhosees it. It’s true, as the spokesperson claims, that the line standers take tickets that would otherwise go to people farther back in the queue who are eager to see the play. But those who wind up with those tickets are also eager to see the play. That’s why they shell out $125 to hire a line stander. In 2011, however,The Sacramento Beereported that ticket scalpers were offering Yosemite campsites for sale on Craigslist for $100 to $150 per night. The National Park Service, which prohibits the resale of reservations, was flooded with complaints about the scalpers and tried to prevent the illicit trade.34 According to standard market logic, it’s not clear why it should: If the National Park Service wants to maximize the welfare society derives from Yosemite, it should want the campsites to be used by those who most value the experience, as measured by their willingness to pay. So rather than try to defeat the scalpers, it should welcome them. Or it should raise the price it charges for campsite reservations to the market-clearing price and eliminate the excess demand.